Struggling with Series 7 Options Questions? Click here to view in a downloadable PDF format. Author AsayPosted on October 13, 2017 October 24, 2017 Categories FINRA, Series 7, Study TipsLeave a comment on Struggling with Series 7 Options Questions? One question everyone asks when encountering any exam is: “How do I pass the first time?” Solomon Exam Prep has been helping their students pass securities exams for over a decade. For many years Professor Karen Solomon (PhD, University of Chicago) taught and researched how the brain learns and memorizes information. Based on her research, Solomon Exam Prep has come up with some tried and true study tips that will help you pass your exam the first time. The first thing to remember is that the over-studiers are more likely to succeed. There are many costs associated with taking these exams, so it is in your best financial interest to pass the first time. Increase your chances of passing the first time by following Solomon Exam Prep’s suggested study schedule; you will thank yourself later. Reinforce learning by engaging multiple senses. You want to learn the content, not just memorize it. Reinforce your reading by following along with the Audiobook or reading out loud to yourself. By engaging your other senses, you are more likely to remember the content. We also recommend reading your Study Guide multiple times as you do not always retain everything the first time around. The combination of repeated reading and engaging other senses is sure to drive home the material and increase memory retention. Make your own flash cards. Many other companies create and sell flash cards, but Solomon Exam Prep does not. Why? To help you better learn the material. When you actively sit down and create your own flashcards, you are more likely to recall the information. This goes along with engaging multiple senses; reading and transcribing the content you find important helps to reinforce learning. We encourage all of our students to create their own flash cards. Take practice quizzes. Practice makes perfect! You will not know how much material you have retained until you take practice exams. We encourage our students to take quizzes after every chapter they read. Focus on learning the content and avoid memorizing the questions. Review the rationales for any incorrect answers; not everything may be in the book, so make sure you pay attention to new material in the quizzes. As you approach your exam date, you should be taking full, timed practice exams to best prepare for the actual one. We highly encourage our students to average in the mid 80’s before sitting for the exam. Take breaks and rest up. It is important to give yourself a break as you are studying. You might try setting a timer to remind yourself to take a break. (It does not help to cram.) Remember: Sleep is important! Before your exam date, make sure you get enough sleep; do not stay up all night cramming. Your brain functions much better when it is well rested. Review your Study Course and notes. If you have a recorded class, re-watch it prior to your test date; this is a great review. If you do not have a recorded class, go over your notes and flash cards prior to your exam. 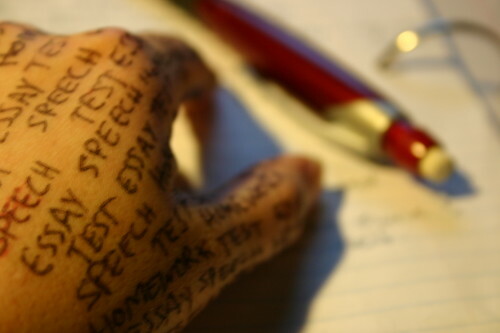 You can also re-review your last full exam, taking note of any questions you might have answered incorrectly. This serves as a great final refresher before your exam. Which of the following is not true regarding tender offers by third-parties? Rationale: The following are tender offer rules relating to third-party tender offers. –Whenever the bidder purchases or intends to purchase more than 5% of a company’s outstanding shares, it must file Schedule TO. It must also file a Form 13D, which is a beneficial ownership form. — All recommendations on the tender offer made by (1) the targeted company and its affiliates, (2) shareholders of the target company, the bidder, and affiliates of either, and (3) anyone acting on behalf of the forgoing or on behalf of the bidder must be made using SEC Form, Schedule 14D-9. The bidder does not use Schedule 14D-9 if it has filed Schedule TO. –While the same price must be given to all shareholders as in an issuer’s offer, third-party offers allow an exclusion for certain severance/benefits packages that have been approved by an employee compensation committee. –The bidder cannot buy shares outside of the tender offer during the offer period. –The target firm’s management must communicate a position on the tender offer within 10 business days of the offer. The recommendation can take the form of: (a) accept or reject; (b) remain neutral; or (c) take no position. The target firm’s management must explain why it takes that position. It cannot recommend that shareholders buy shares in the company. Rationale: Section 13(d) requires an individual or group acting together to file a 13D form when their stockholdings reach 5% of a corporation’s outstanding shares of common stock. This rule gives a corporation that may be the target of an acquisition fair warning in advance. Schedule 13D requires the group to disclose the number of shares owned, background information on the individual filing the form, the purpose of the transaction, and the source of the funds to finance the acquisition of the shares. Schedule 13D must be filed within 10 days of the acquisition of the stock. This week’s study question from the Solomon Online Exam Simulator question database is now available. Be sure to submit your answers in the comments section below. ABC Corporation 6% preferred stock is convertible at $20. ABC Common trades at $25/share. What is the parity price of ABC preferred stock? Rationale: First we must take the convertible price and divide it into the par value for the preferred stock to find out how many shares of common stock would be received for one share of preferred stock. $100/$20 = 5 shares of common for each share of preferred. 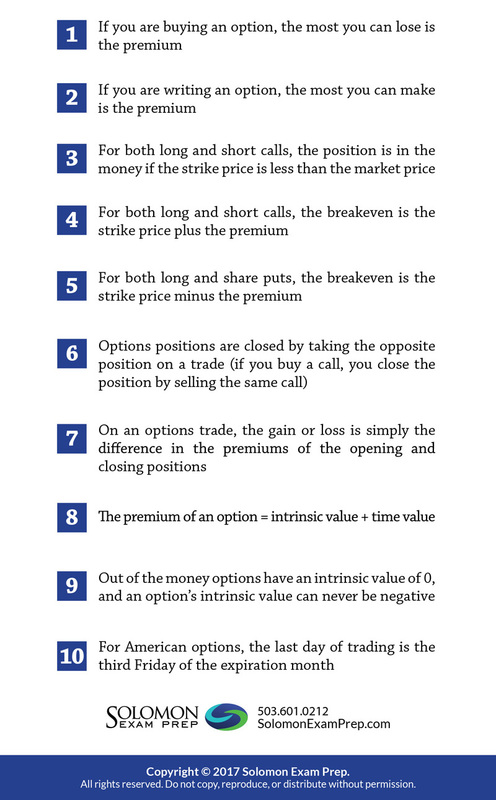 Then we must multiple the number of common shares times the price of the common stock. 5 shares * $25/share = $125/share. The parity price of ABC preferred is $125/share. A couple has just had a baby and they want to start saving for college. What option does NOT offer the opportunity for their investment to grow free of federal taxes? Rationale: Unlike the other options, UGMA/UTMA (Uniform Gifts to Minors Act/Uniform Transfers to Minors Act) accounts are subject to federal income and capital gains taxes. Given the following assumptions for stock ABC, what is its expected return using the Capital Asset Pricing Model (CAPM)? Assumptions: Risk Free Rate: 1%; Expected Return on general stock market: 7%; Beta: 1.; Sharpe Ratio: 2. Rationale: The formula for the Capital Asset Pricing Model (CAPM) is given by the following: Return on Stock = Risk Free Rate + Beta of Stock x (Return on Market – Risk Free Rate). Plugging in for Stock ABC gives Return on Stock ABC = 1% + 1.5 x (7% – 1%) = 10%. Note the Sharpe Ratio is not used in the CAPM formula.